I have a picture that I shot in landscape (4x6 ratio) that I want to crop to portrait (5x7 ratio). I see how I can do a 5x7 landscape or a 4x6 portrait, but not a 5x7 portrait. While you can drag corner handles and hope to get it right, the easiest way is to press the X key on the keyboard. When you are in crop mode in development module, grab tool before Aspect text, click on the picture and draw in desired orientation. This method is slightly different from the others and should work every time without problems. If you drag the cropping handles far enough the aspect should automtically flip between landscape and portrait while retaining the aspect ratio. You should be able to just drag a corner handle over the top edge, and the orientation will change. It should be noted that Lightroom will not change the orientation if the crop box is too large to fit in a particular orientation. 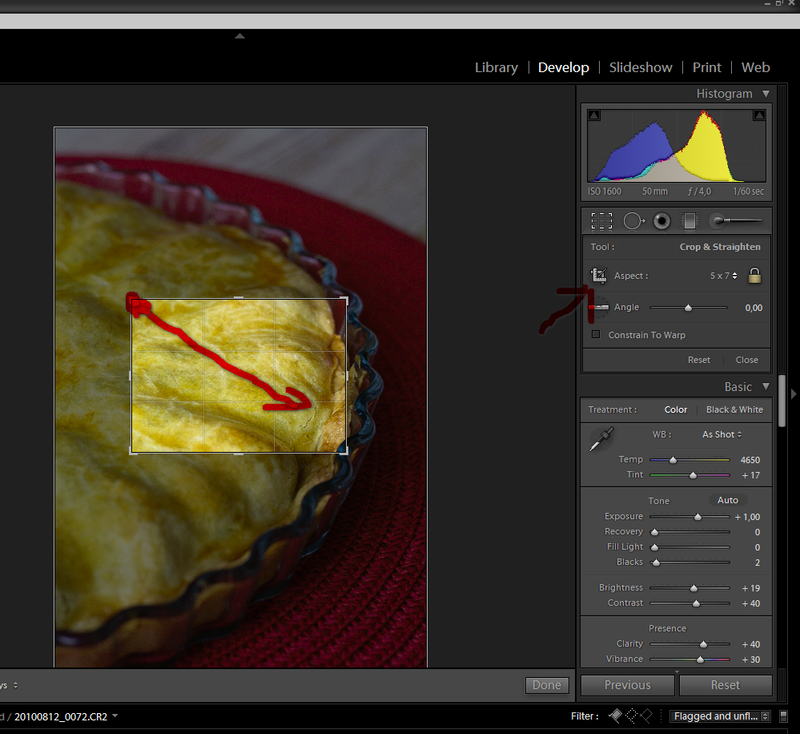 It is best to shrink the crop box small, reorient, then resize and pan as necessary. Just figured this out! You have to be in Library mode; there is a little curved arrow below each pic, that's what you use to rotate the orientation. Under the menu "settings" click on "rotate crop aspect" which is found near the bottom. Either will flip the entire image. Is there a way to have Lightroom include the cropped aspect ratio in the filename when the file is exported? Is there a tool that provides hotkeys for crop ratios when editing raw files?